Toyohara Kunichika (1835-1900) Thirty-Six Modern Restaurants: Restaurant Hirasei at Fukagawa, 1878. Oban. This outstanding piece of design is from a little known series by Kunichika from 1878. 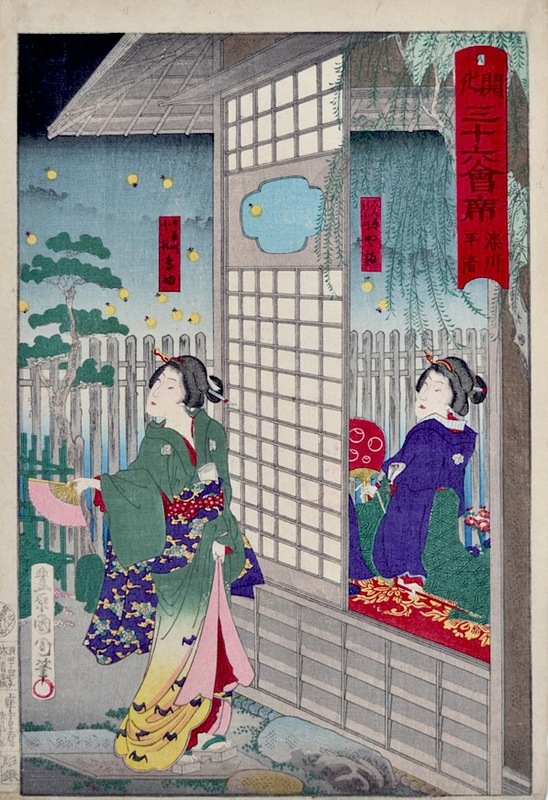 Kunichika was commissioned by businesses from time to time, as were other ukiyo-e artists. This form of sponsorship has an echo today with modern forms of product placement, Kunichika produced another set of commissioned restaurant prints in 1871 and Hiroshige and Kuniyoshi worked on similar scenes. The practice shows how popular woodblock prints were at the time with the urban public and might compare today were Coca-cola to commission Damien Hirst to produce an affordable edition of photographs for example. This print shows a rural restaurant, the scene lit by fireflies and populated by the two sophisticated and elegantly dressed women. There are few clues to read in this piece, though the women are carrying small rolls of tissue which is normally a visual clue to their occupation as prostitutes. The advertising message may then have been directed at sophisticated males looking for discreet entertainment. As with the previous piece, the architecture and drawing are immaculate and the scene of ‘floating-world’ pleasure is beautifully realised. A very nice print with fine colour and impression and in fine condition.